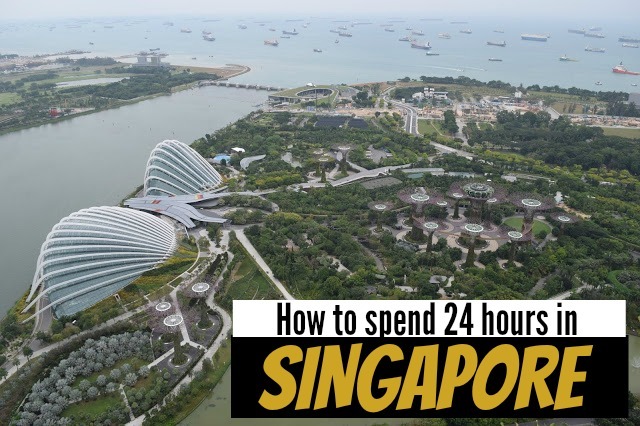 Do you only have 24 hours in Singapore? Maybe you've got a long layover in Singapore, or maybe you're having a short, and thus affordable, respite from SE Asia. Whatever the reason, we've got you covered. I loathe to use the word 'done' when it comes to countries, like: 'Singapore can be done in a day', because lots of people get touchy about it, but really, if you think about how little time you have in your life, and how many countries you want to go to, there are worse crimes than saying Singapore can be done in a day. Okay, so now we've discussed terminology, let's get to it: How can you make the most of your 24 hours in Singapore? I've put this first as it was our favourite thing about Singapore, though chances are this will be one of your last stops on your 24 hour trip. Gardens by the Bay does what it says on the tin: it's literally a garden by the bay, though nevertheless a very beautiful one. The best time to go is around 7.30pm or 8.30pm, because at 7.45pm and 8.45pm the garden puts on an impressive 10 minute show (free). Observation Deck - Go up to the Skydeck for the best views of Singapore. Stay - simply stay at the Marina Bay Sands! Note: You cannot use the famous pool unless you are a guest. 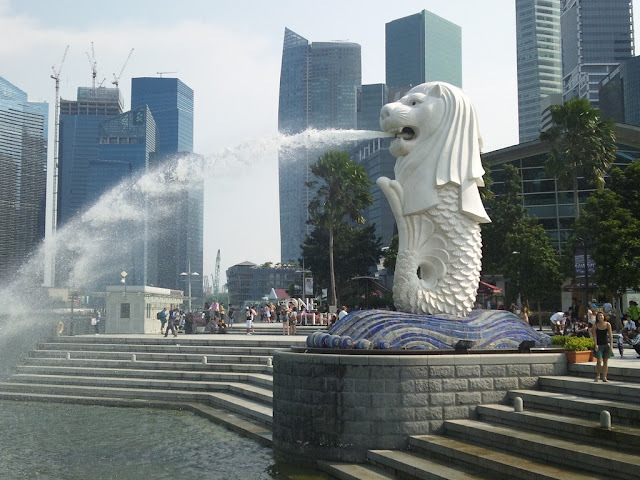 It's debatable whether the Marina Bay Sands or the Merlion is the most iconic site in Singapore (MBS has the size and fame, the Merlion appears on the coins and all the brochures). At any rate, make sure you go and see both! They are opposite each other and easy to tick off together. Singapore is an incredibly religiously diverse nation. The 2015 census of Singapore shows Buddhism, Christianity, Atheism, Islam, Taoism and Hinduism are represented in almost equal percentages (33%, 18.8%, 18.4%, 14%, 11% and 5% respectively). Compare that with say the UK (49% Atheism, 42% Christianity, 5% Islam) and I think that's pretty impressive. It's nice to respect the diversity by visiting one (or more) religious structures in Singapore. 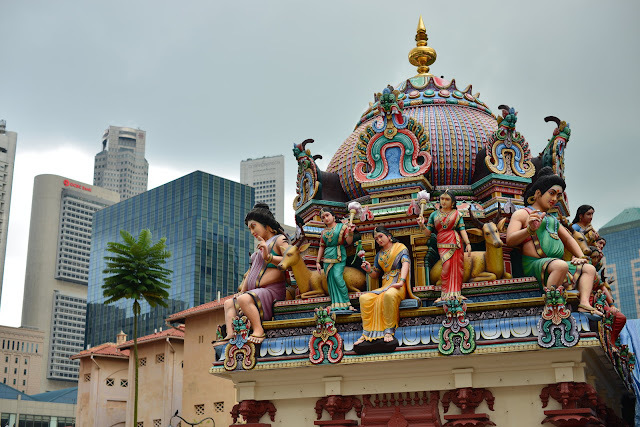 We think Sri Mariamman Temple was the most beautiful of all the religious structures in Singapore, but maybe you think another one is better. Sites we wished we'd seen but didn't have time for include the Singapore Botanic Gardens, China Town and one of the Cat Cafes. Most people will tell you how expensive Singapore is, we were pleasantly surprised to find it no more expensive than Europe. Nevertheless this means that it is indeed more costly than say Thailand, Cambodia or Vietnam, especially when it comes to finding a hotel. But we have a rule when it comes to expensive countries: don't go for budget accommodation. If we're going to pay for hotels we're going to want to make sure it's a good one. It may sound counterintuitive, but if we're going to pay say £50 per night for something we think is only worth say £20, than I'd rather pay £150 per night and at least have a decent experience.. I hope that makes sense! Singapore is pretty easy to get around. The metro system is very good: pretty clean, very clear, with a super-modern look. One thing we particularly liked about it, is that if you get lost (like we did), and go one or more stations further than you've paid for (like we did), you can simply top-up your card when you exit. There is also a system of paying a little bit extra for your metro ticket, and if you re-use it the third time is cheaper to make back the cost. This is good as it encourages people to re-use that one card. The system really is very clear (we got lost because we're stupid) here's a useful map to help Singapore MRT & LRT System Map (note there is no need to print this off as this map is in all of the stations). There are two problems with the metro though: firstly, it doesn't really stretch across the whole city (which is crazy considering how small Singapore is). There will be times where you have to get a car, or walk for ages and ages. The second problem is that despite the metro going right into the airport (which is great), it still doesn't guarantee that you will get to your plane on time if you take an early flight, because of rush-hour and such. Anyway, we had an early flight and decided to go with a hire car company. This was one of the best decisions we've ever made. Money and status are very big in Singapore, and we felt super cool 'keeping up with the Joneses' and racing through the city in a sleek Mercedes. We went with Blacklane and we recommend them very highly. Feel free to read our Blacklane review and/or take a 10 EUR/USD/GBP discount on us with the code 624GRVGP. 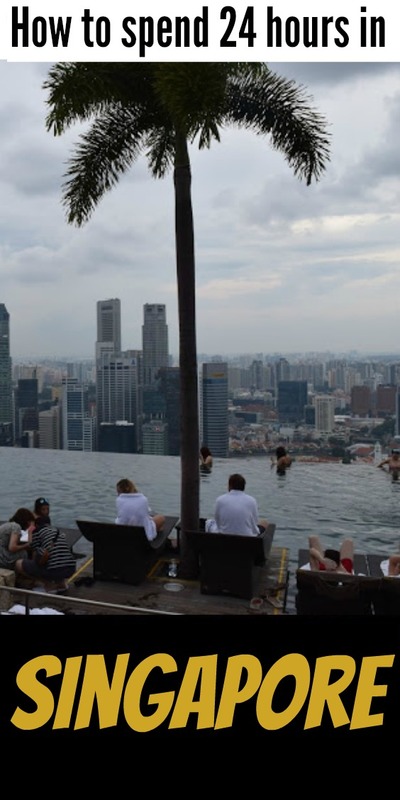 The Marina Bay Sands is without a doubt a luxurious and grand hotel, and staying here is the only way you'll be able to snap a insta-good photo of you in their infinity pool to make your friends jealous. 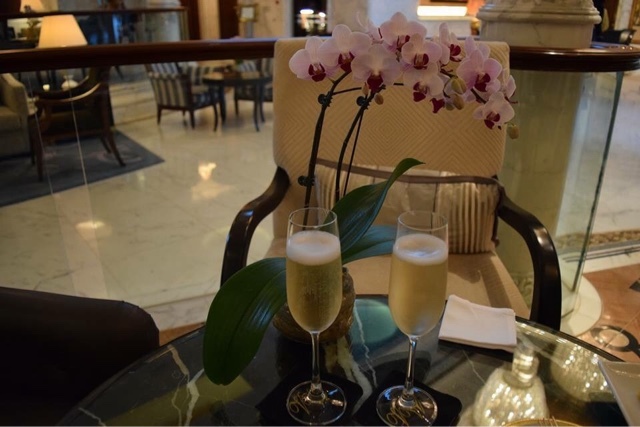 The Shangri-La Singapore is our absolute favourite place to stay in Singapore, it's beautiful, it's classy and it's beyond luxurious. We highly recommend you stay here if you get the chance, you won't regret it. The Parc Sovereign can't really hold its own against the likes of the Marina Bay Sands or the Shangri-La, but if you're just looking for a nice place to sleep that's conveniently near the tube station, the Parc Soverign is for you. There are many great AirBnBs in Singapore, if it's you're first time with AirBnB, we are happy to give you this AirBnB discount. House Sitting is one of our favourite ways to travel. It's true that there aren't that many house sits available in SE Asia, but Singapore isn't really like the rest of SE Asia, and with lots of expats from the UK and Australia living there, house sits in Singapore do pop up now and again. Have a browse of House Sits in Singapore to see if any are suitable to you, and don't forget to sign up to our mailing list (at the bottom of every page) for your 10% discount to house sitting!! We have happily started making daily vlogs on YouTube, this is our playlist of the time we spent in Singapore, enjoy! Singapore is known for it's weird and wacky rules - for example did you know gum is illegal there? Click here for more interesting facts about Singapore. Like many, our stay in Singapore was short but sweet: long enough to enjoy the beauties of being able to drink the tap water and flush toilet roll, but short enough not to take these wonders for granted. We hope this has been helpful for your own trip to Singapore, if it has, please help us out by following us on Facebook, Instagram, Twitter, Snapchat (travelweasels) and YouTube. Loved this post? Pin it to your bucket-list! Fancy winning a GoPro or a trip to Europe? Check out Accor Hotels 24 Hours In... competition to find out more! Over to you: Have you been to Singapore? What have we missed out?